Braden “Pep” Fujas is a professional free-skier. Pep Fujas came to us in the summer of 2013 because of an injury to his ACL replacement graft. 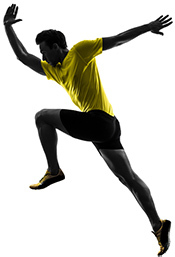 At The Stone Clinic, we have extensive experience in revising failed or re-injured ACLs. Dr. Stone repaired the injury to the posterolateral corner of Pep’s knee with a donor tendon and placed a new donor ACL in the correct anatomic position on the femur while preserving some of the previous surgeon’s graft. Pep’s own hamstrings had previously been used to replace his ACL, which had left him slightly weaker in knee flexion. Pep was adamant that he didn’t want to lose any more of his own body structure in the revision. At The Stone Clinic, we use donor tissue for ACL and other knee ligament replacement. The patellar tendon with bone blocks at each end has been proven to be the strongest tissue. Fixation works best when bone is attached at both ends of the graft. We have extensive experience in revising failed or re-injured ACLs. Dr. Stone repaired the injury to the posterolateral corner of Pep’s knee with a donor tendon and placed a new donor ACL in the correct anatomic position on the femur while preserving some of the previous surgeon’s graft. Pep dropped his crutches after day 1; swelling and pain were minimal. As a professional athlete, he had a lot at stake. With his positive mindset he came to The Stone Clinic for physical therapy every day and anyone who saw him in the gym knew he was giving it everything he had. Pep feels good about his recovery and confident about his chances of getting back on the slopes in better shape than he was before he was hurt. Update: Pep has returned to freeskiing at a world-class level and can be seen in many of the top skiing movies over the past few seasons.